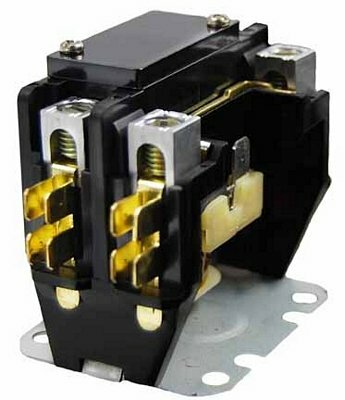 1-Pole 40 Amp 24V Coil Replacement Contactor for Coleman S1-02426018000, Goodman B1360321 & Nordyne 624714 among many others , selling for $13.95 brand new. There are 4 units left brand new. Replaces so many contactors including but not limited to the following: Coleman S1-02426018000 & 024-26018-000; Cutler-Hammer C25ANF140T; Hartland Controls HCCY1NQ04GG303 & HCCY1XQ04GG303; Nordyne 621037, 621038, 621661, 621662, 621662R, 621665 & 621665R; Siemens 45GG10AFA; Johnstone L38-266; Goodman B1360321, B13603-21 & B13603-24. Also CONT1P025024VS, 3100A15Q152L, CONT1P030024VS, XMCK-40DN024EPZ, 45EG10AJA784R & Packard C140A. Definite purpose contactor for air conditioners and other HVAC equipment. Replaces most all contactors of the same specs. Cover on top keeps out dust, debris and bugs.